Ellie Mae - checking for scent ! GLORY - Ready to find your pet! The Bloodhound made its appearance in Europe before the Crusades. The first specimens were brought from Constantinople in two strains: black and white. 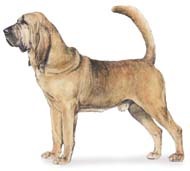 The modern Bloodhound has its origins in the Ardenne region of central Europe. 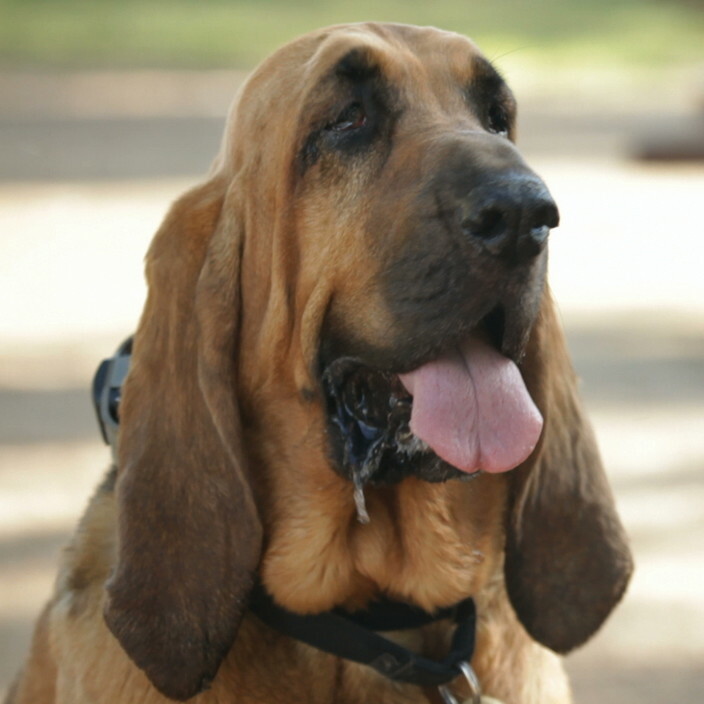 There, the large game hounds of St. Hubert and Talbot and white Southern hounds were crossed to produce the dog known as the Chien de St. Hubert (today's Bloodhound). These "gentle giants" are an extreme example of a scent adapted dog. Their long pendulous ears, moist lips and many folds of loose skin all work to intensify scent around the head as they search, track or trail. With their heads on the ground and the folds of skin covering their eyes, more brain power can be concentrated on identifying and processing smells. 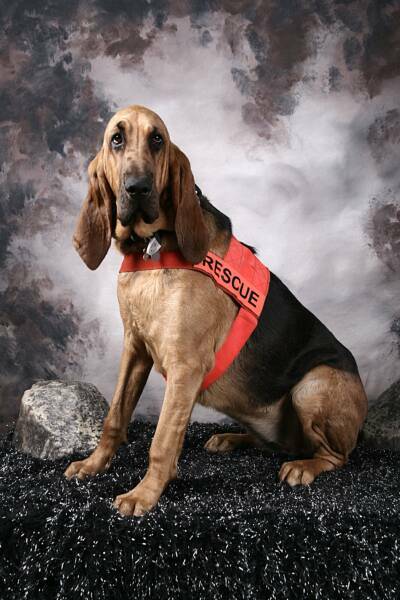 A Bloodhound is the modern representative of the oldest race of hounds that hunt by scent. Using a "scent article" , the hound can trail long distances over different types of terrain. Although these scent hounds are 'naturals', it can take over a year of constant training to teach trailing techniques. It is important to understand about scent. Scent is more unique than a fingerprint. The dog has the capability to match up the unique puzzle of scent on the scent article with the same unique puzzle of scent that matches the same scent trail. The best time to deploy a scent dog is when the air is cooler than the ground. When it is cool, the scent stays on the ground rolling downhill; making it easier for the dogs to detect scent. When the air is hotter than the ground, the scent rises - narrowing the scent path or cone. 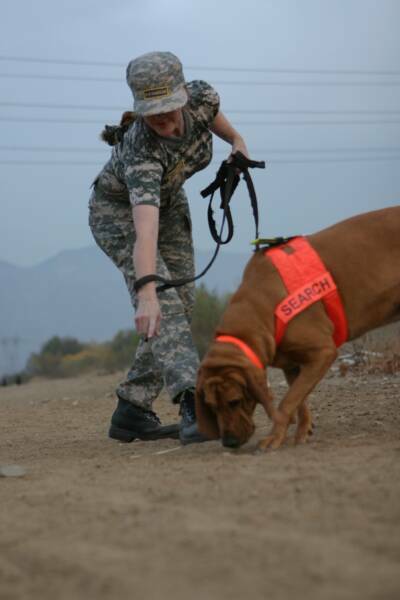 The Search Dog is an asset and a tool that can be invaluable, but their limitations should be understood. A dogs ability to smell is something that can't be measured at this time because there is not an instrument that can duplicate it. A dog's sense of smell is invaluable to the handler because a great part of the dog's role as a trailing partner depends on its ability to pick up a scent. 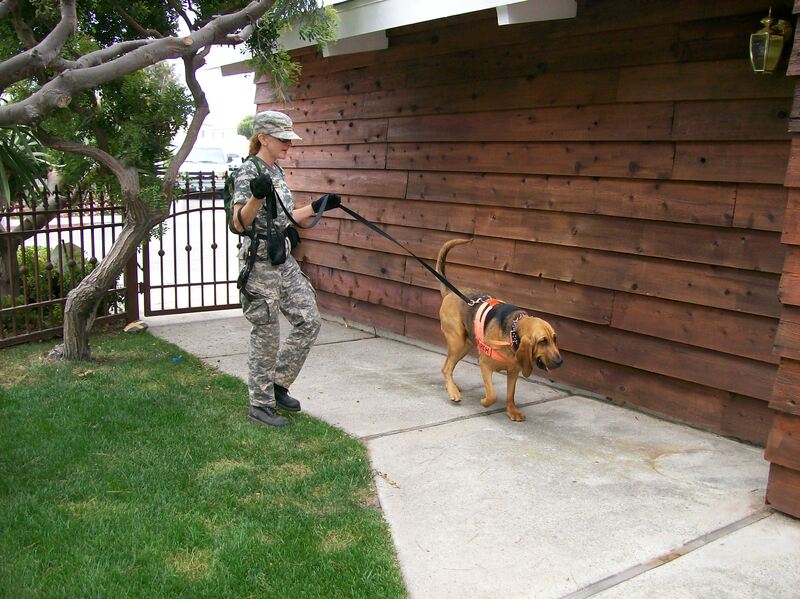 The primary function of a Trailing Dog is to help the handler locate a subject. 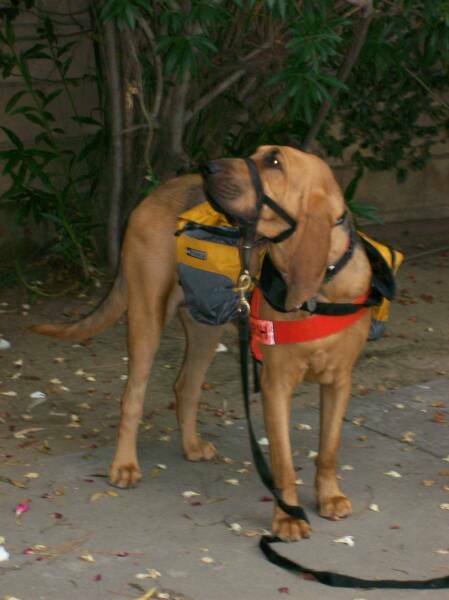 Secondary functions can be locating evidence or witnesses along the scent trail or providing a direction of travel (DOT). Scent conditions: This is a very involved subject with many variables: Time, wind, temperature, terrain, humidity, dust, exhaust, pollutants, cigarette smoke, etc., can affect scent. Rain can be good for scent work while high temperatures are not. Probability of Detection (POD) is affected by an individual's ability, the dog's ability and scent conditions. Glory working a scent trail in the rain...resulting in a correct Direction of Travel (DOT) and greatly narrowing down a Target Search Area (TSA). The lost dog was located in this area the next morning....after being lost for 6 days with no leads!!! November 2012: Diana's first case in Big Bear, CA! Working the scent trail and establishing a direction of travel. 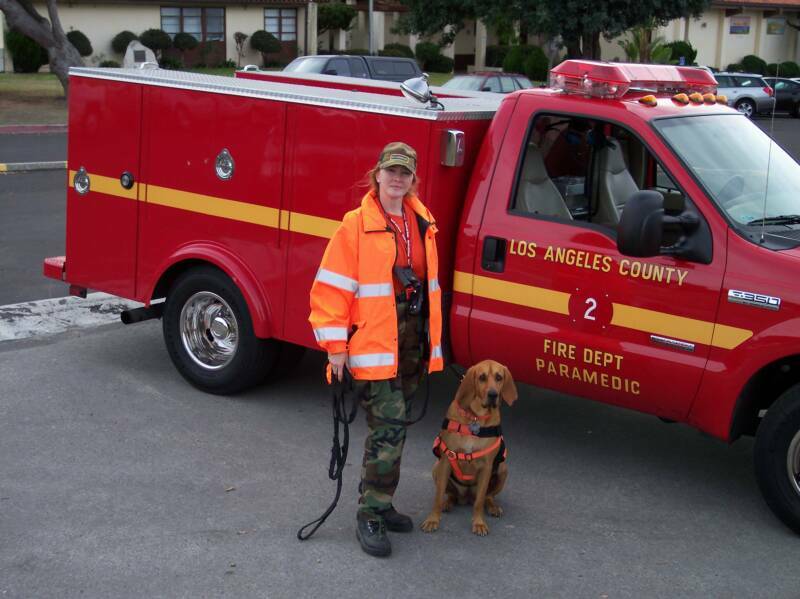 Ellie Mae and me working a case where a dog escaped from a pet sitter.